Mirror, Mirror, on the Wall, which Nation and State Punish Success Most of All? I’ve shared some interested rankings on tax policy, including a map from the Tax Foundation showing which states have the earliest and latest Tax Freedom Days. There’s also a depressing table showing that the United States “earns” a lowly 94th place in a ranking of business-friendly tax system. Heck, there’s even a map showing the states with the highest wine taxes, as well as a map showing which states have the lightest and heaviest tax burdens compared to income. 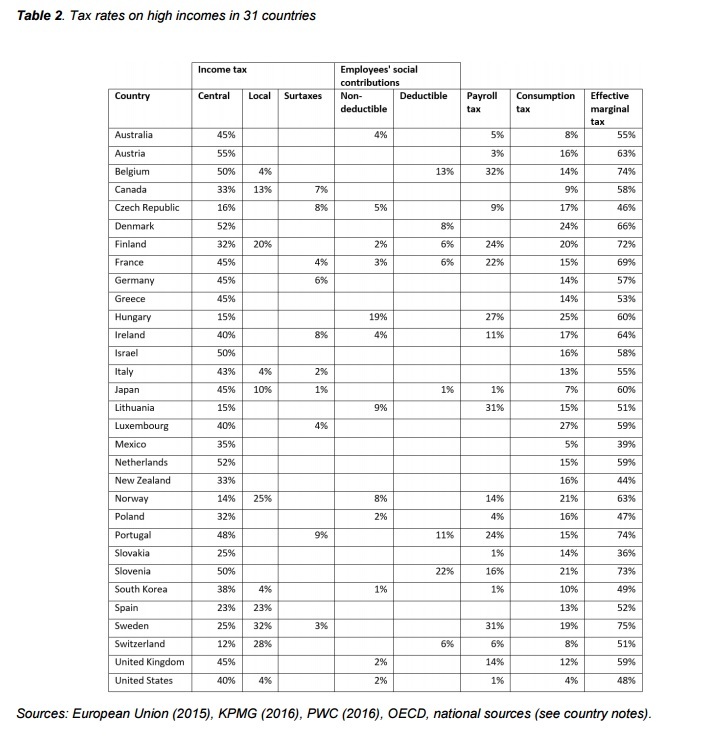 So I was very interested to see this table from the Tax Foundation revealing which countries have the most punitive regimes for penalizing success. 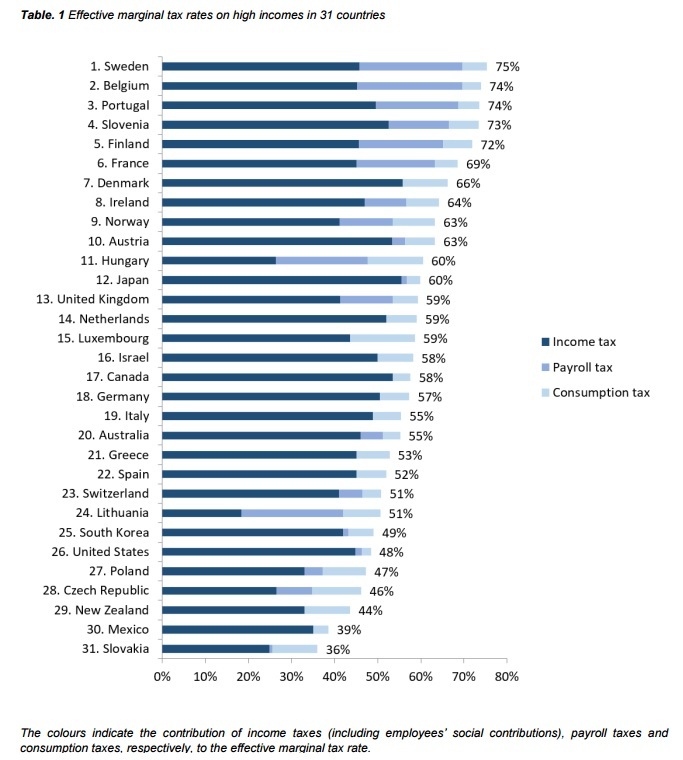 Portugal has the dubious honor of having the most progressive (i.e., discriminatory) tax system in the developed world. I don’t think anyone is surprised to see France in second place, though I confess that I was not expecting to see pro-reform success stories such as Chile and Canada in the top five. And I’m totally embarrassed that the United States is #8, worse than such garden spots as Greece, Mexico, and Belgium. Though it’s important to understand that the Tax Foundation is relying on a narrow definition of progressivity. One way to measure and compare the progressivity of income tax codes across countries is to express the level of income at which each country’s top tax bracket applies as a multiple of that country’s average income. That’s a useful bit of information and it shows one aspect of progressivity, but it’s also a bit misleading since it implies that the Swedish tax system (with a top tax rate of 56.7 percent) is less progressive than the Slovakian tax system (with a top tax rate of 21.7 percent). You won’t be surprised that I think a ranking that purports to show the burden of “progressive” taxation should include the top tax rate. Speaking of which, this is why I like the Tax Foundation’s measure of progressivity on the state level. The…table also shows the gap between the top marginal tax rate and the marginal tax rate on $25,000 of taxable income. …Twenty-one states and the District of Columbia have progressive rate structures that rise after $25,000. California, New Jersey, and Vermont have the most progressive rate structures by a wide margin. Who could have guessed that California would be the worst state, though I’m not surprised to see New Jersey (the worst place to die) and Vermont (worst place for self reliance) have such poor ratings as well. And is anyone even remotely shocked to see that states with no income taxes manage to avoid any problems with ‘so-called” progressivity? Not surprisingly, they also grow faster and create more jobs. The moral of the story, at the very least, is that America needs a simple and fair flat tax. And not the Obama or Hollande version.